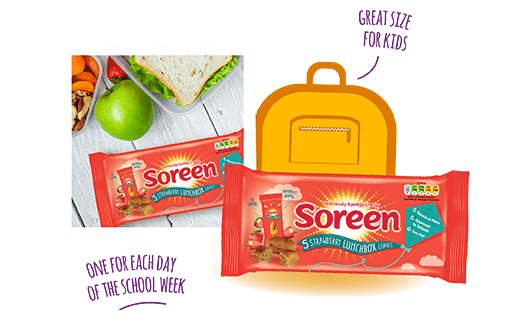 Keep the Lunchbox Police happy with these individually wrapped loaves, they meet school lunchbox standards and are low in fat and are also suitable for Vegans. Fortified Wheat Flour (Wheat Flour, Calcium Carbonate, Iron, Niacin (B3), Thiamin (B1)), Water, Strawberry Pieces (7%) (Concentrated Apple Puree, Strawberry Puree, Fructose Glucose Syrup, Humectant: Glycerol, Sugar, Wheat Fibre, Palm Fat, Gelling Agent: Pectin, Acidity Regulator: Malic Acid, Colouring: fruit and Plant Concentrate, (Concentrate of Carrot, Pumpkin, Blueberry), Natural Flavouring), Sugar, Maize Starch, Strawberry Puree (5%), Partially Inverted Refiners Syrup, Malted Barley Flour (1%), Vegetable Fat (Rapeseed, Palm), Natural Flavourings, Salt, Yeast, Preservative: Calcium Propionate. For allergens, including cereals containing gluten, see ingredients in bold. 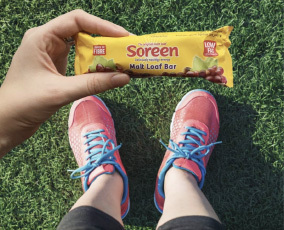 Produced in a factory which handles soya, oats and milk ingredients.